Sometimes one’s universe must really shake. Yes, it has been awhile. A blog entry just for you this day. I write from my back porch. The summer breeze… perfect. The cats are laying long and contentedly. As my world calms down I make time for you, the reader; the appreciator; the curious; even the bored. I commit to post upcoming and existing shows; details of processes, inspiration, amazing makers that I know, and category-less topics because it feels right again. A current work on exhibit through December 18th at Governor’s State University – University Galleries. Please, make some time to go see it and other works by the community that is Lillstreet Art Center and LillstreetStudios. With many thanks to Jeff Stevenson, Curator, for including me in the exhibit. 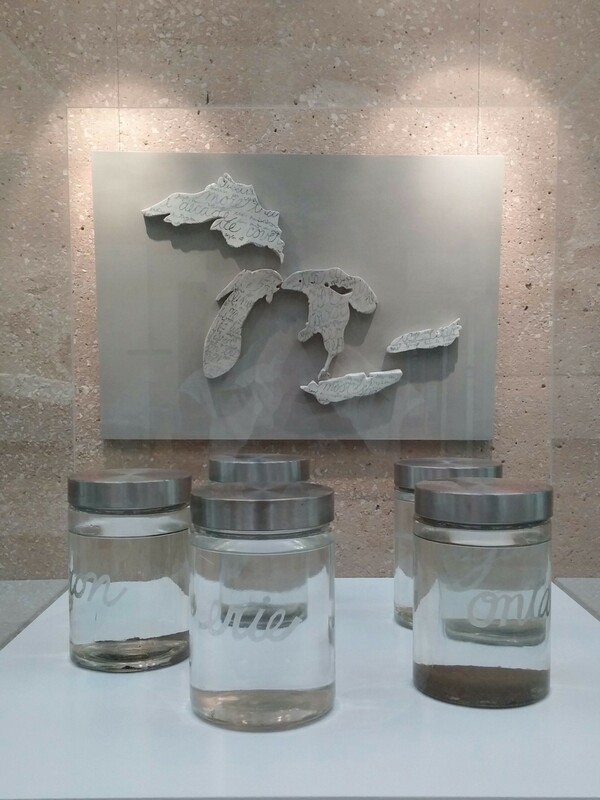 Porcelain, iron oxides, asemic writing, facts/statistics about the Polar Vortex of 2014, melted snow and ice from each of the Great Lakes, collected by the artist (and one from a friend of a friend of a friend! Posts to come) during the Winter of 2014. Watch for my next post about my Social Practice work titled Sewing Forgiveness that will be conducted from many points throughout the City of Chicago.